All non-catalytic stoves have emissions with cordwood that are worse than EPA results. Only catalytic and hybrid stoves perform better with cordwood. The EPA tests are conducted with “dimension lumber” (Douglas Fir 2x4s and 4x4s) in an attempt to keep the fuel the same from one stove to the next during testing. Now the EPA wants to test using cordwood to get a better idea of how stoves perform in the “real world”. Virtually all non-catalytic stoves perform much worse (higher emissions) in the “real world,” but when our catalytic and hybrid stoves are tested using cordwood (i.e. “real world fuel”), emissions go down rather than up. We have confirmed this in our own lab, as well as through testing by an independent lab. This puts us in an unusual position. The woodstove industry keeps telling EPA that woodstoves just can’t burn cordwood cleanly. But our experience is just the opposite. We get low emissions whether we use EPA test wood or “real world” cordwood. 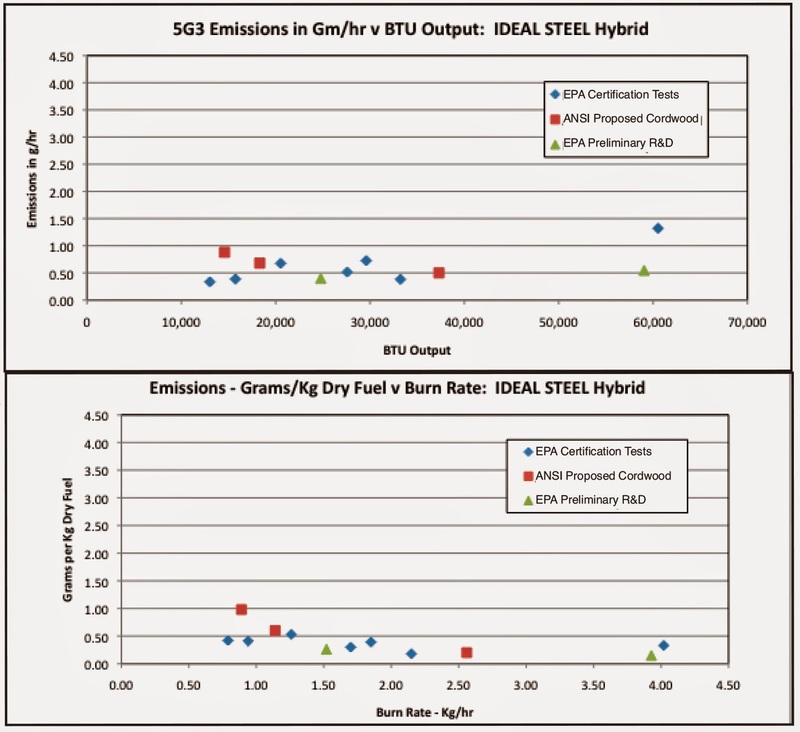 There are many reasons that catalytic and hybrid stoves perform better in the “real world”. One reason is that newer catalysts are made of stainless steel foil that is only 50 microns thick (about the same thickness as a human hair). The thin foil heats up quickly and begins to clean up the exhaust almost as soon as the fire is kindled - long before secondary combustion can be established. This is important, because cordwood doesn’t burn as fast, or as hot, as the dimension lumber that EPA uses to test stoves. In the “real world,” stoves need to burn cleanly at low temperatures, something at which only catalytic stoves are adept. Our hybrid stoves were the first stoves to use both secondary combustion and a foil catalytic combustor. The stove adjusts between the two systems automatically, and is simple to operate. Our high efficiency ratings are not an accident. We direct the heat from our hybrid stove catalysts at the front of the stove, where more heat is usually desired. We capture the extra heat from the firebox, secondary combustion and catalyst before it starts to go up the chimney. We have designed high-temperature cooktops in our hybrid stoves so you can use the extra heat. We were the first company to use a radiator to distribute catalyst heat to the sides of the stove. What this means is that if you use a catalytic stove or a hybrid stove, you will either get more heat or burn less wood. The effect of increased efficiency can be eye opening, as the chart below shows. Most people burn their woodstoves at the rate of 1.0-1.5 kg/hr (outlined in yellow). The improved efficiency of a hybrid stove can mean up to 131,000 BTUs/day more heat than with a less efficient non-catalytic stove (566,222 BTU/day at 82% efficiency - 435,000 BTU/day at 63% efficiency = 131,222 BTU Additional per day). Catalytic and hybrid stoves are the cleanest burning cordwood stoves in America. They also produce more heat for every pound of wood that you burn.